How do I get my cat to cuddle at night? This question has haunted many cat owners over the years. See, cats are very solitary animals. They like doing their own thing. And it doesn’t help that cats like to move around and get up at night. But with enough patience and discipline, you can convince them to join you for a good night sleep! And if you read on, you’ll find our step-by-step guide to ensure you and your cat cuddle throughout the night! 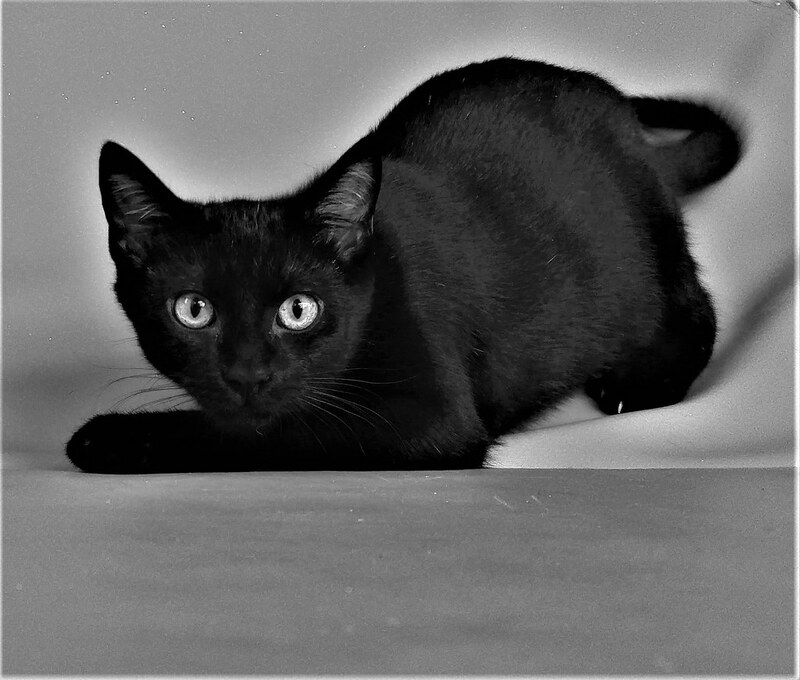 If you keep them occupied during the day, your cat will be less prone to getting up at night. In other words, a tired cat is a sleepy cat. Not really groundbreaking information but useful in your quest to get your cat cuddling at night. With this in mind, there are many things that you can do to keep your cat active. For example, try playing with them. I found my cat loves playing with string, so, I wiggle the string around the floor and watch him go nuts. But if you do opt for using string, don’t leave it out because your cat could end up choking on it. And nobody wants something awful like that to happen. 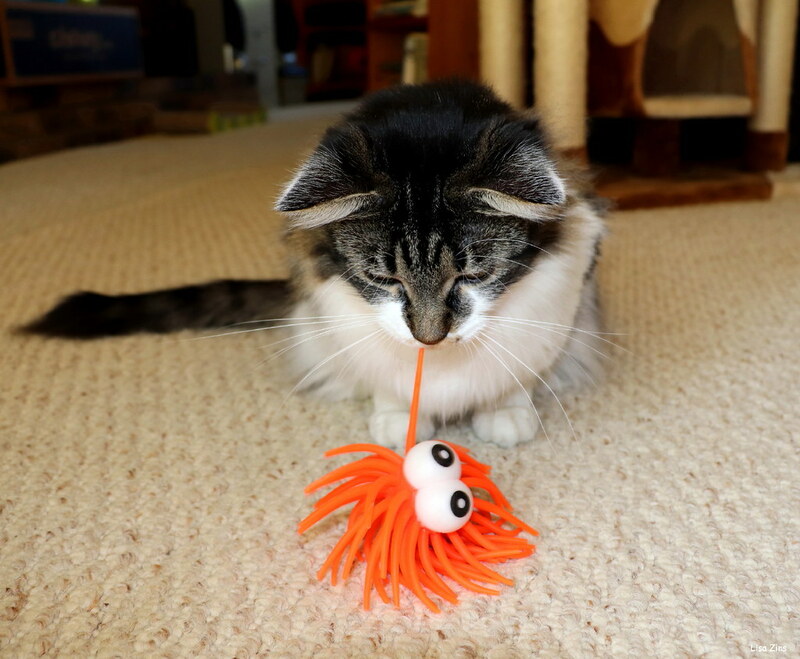 If you don’t feel comfortable using string, another other could be a puzzle toy like this one that will keep them entertained during the day. You could also get them a cat leash and walk them around the block. I know, this idea sounds a little weird, but you cat might enjoy it. I have never tried it, but I have friends who say their cats love it. 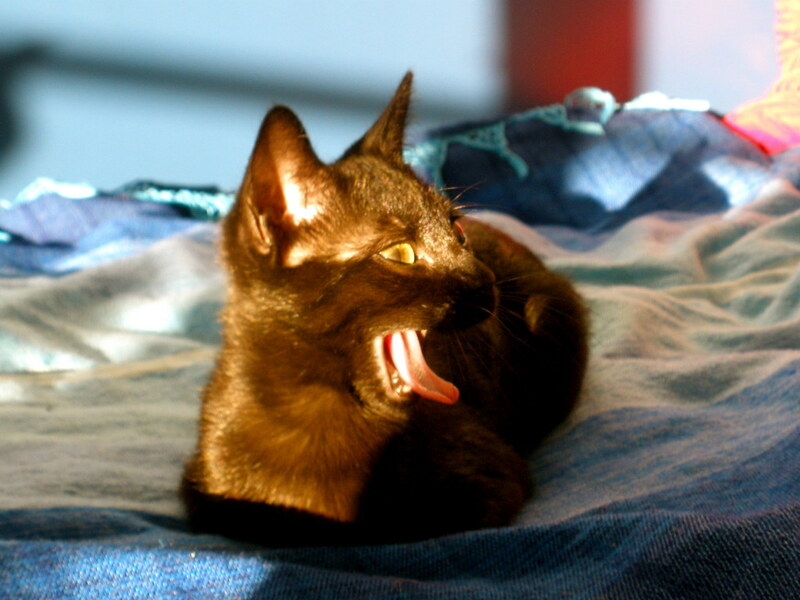 A ten-minute play session right before bedtime will get rid of any excess your cat might have built up during the day. Also, if you keep the time consistent, your cat will eventually associate this play session with bedtime. In a sense, you’re tricking your cat into adapting their sleep schedule to yours. I find that about 30 minutes before bed is an appropriate window for this play session. Just like humans, cats are prone to sleeping after big meals. So, use this to your advantage and offer them food right after your nightly play session. In doing so, you’re increasing the odds your cat will sleep through the night. 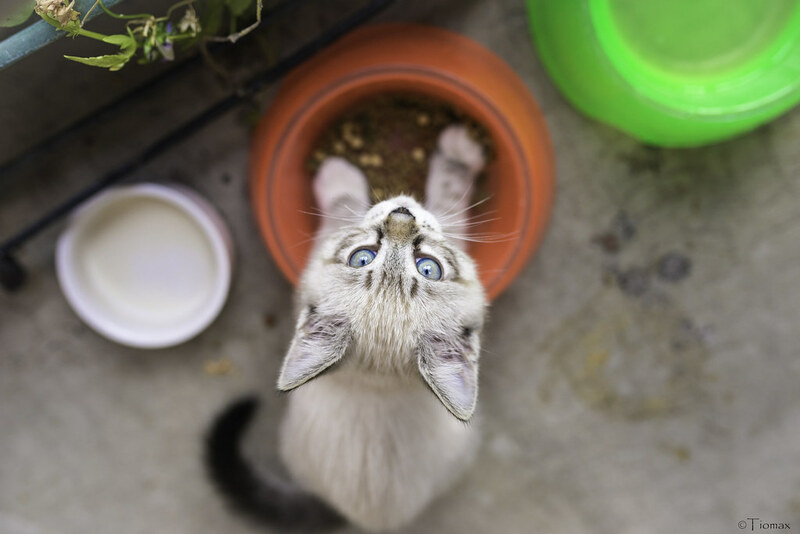 Although this might be tough for cat owners who leave food out all day long, you can still entice them to eat by adding new food into their feeding bowl. For me, adding in fresh food works exceptionally well, and he sleeps all through the night without any issues. 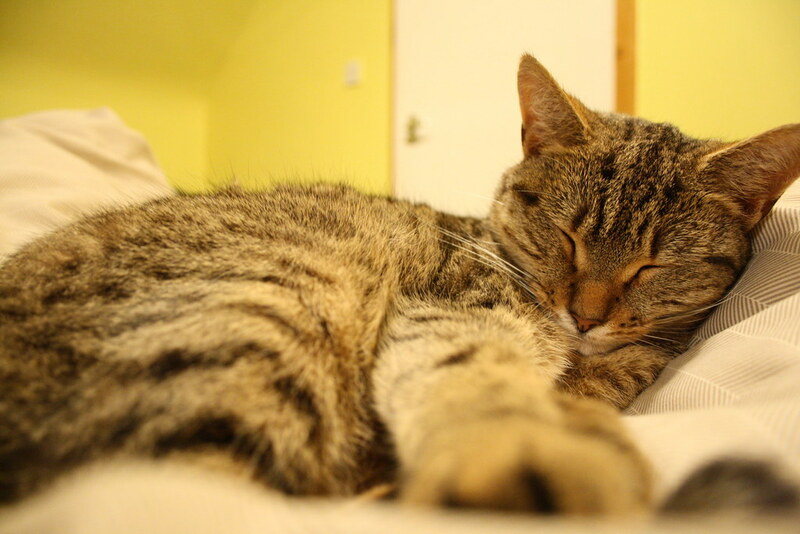 Related: Catnapping: 3 Reasons Why Your Cat Spends More Than Half the Day Asleep! Now, this step is about getting them comfortable with sleeping in your room. See, you want your cat to become gradually more accepting of sleeping in your room. Forcing them isn’t going to work, in fact, it will probably make things worse. Try putting a perch near your bed. It will offer your cat a nice elevated spot to sleep that we all know cats love. Before my cat started sleeping in my bed, I bought him this wonderful perch and stuck onto the wall in my room; he loved it. If you’re having a hard time getting your cat to use the perch, try using some treats as an incentive. Once your cat’s comfortable sleeping in your room, try enticing them into the bed with treats. In doing so, your making them associate the bed with treats, which makes the bed seem like a positive thing. In a sense, it’s all about making your cat understand that the bed is a safe place where they get plenty of positive reinforcement and praise. So, when your cat spends time on the bed, make sure you praise them and give them treats. For my cat, Temptations cat treats work exceptionally well. He absolutely loves and will do anything to get some. In fact, these treats really sped up the training process and got him to start cuddling quickly. However, it’s essential you don’t force them to stay on the bed. 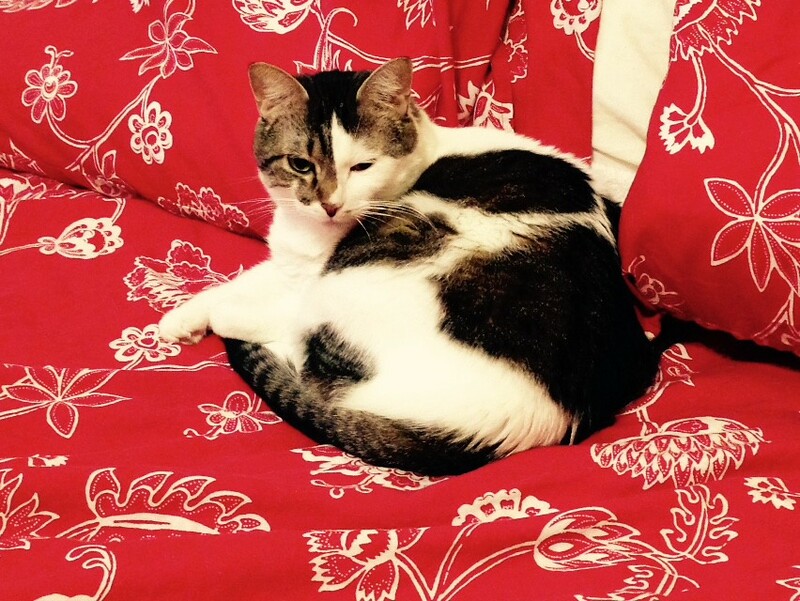 If your cat jumps off the bed, don’t pick them up and place them on the bed. 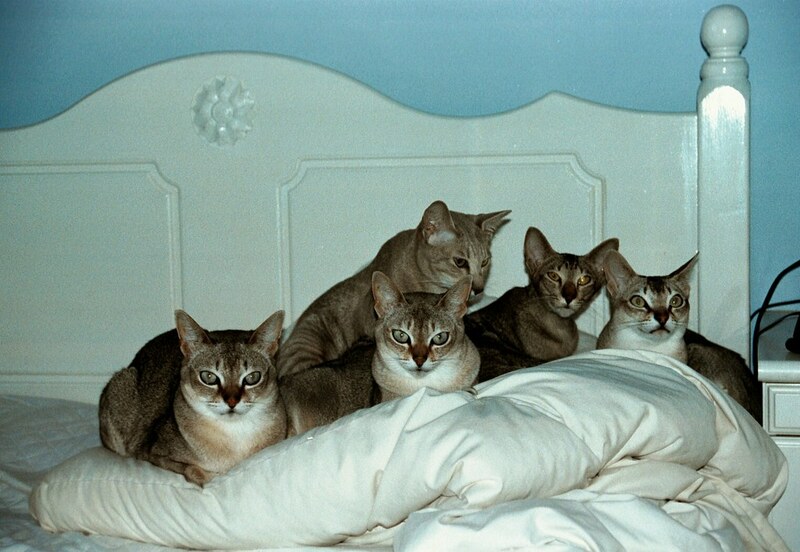 It will only make them associate the bed with being a place of annoyance. Instead, let them walk away and try again with treats later. Eventually, they’ll understand what you’d like them to do. If your cat stays reluctant, try putting on different sheets. 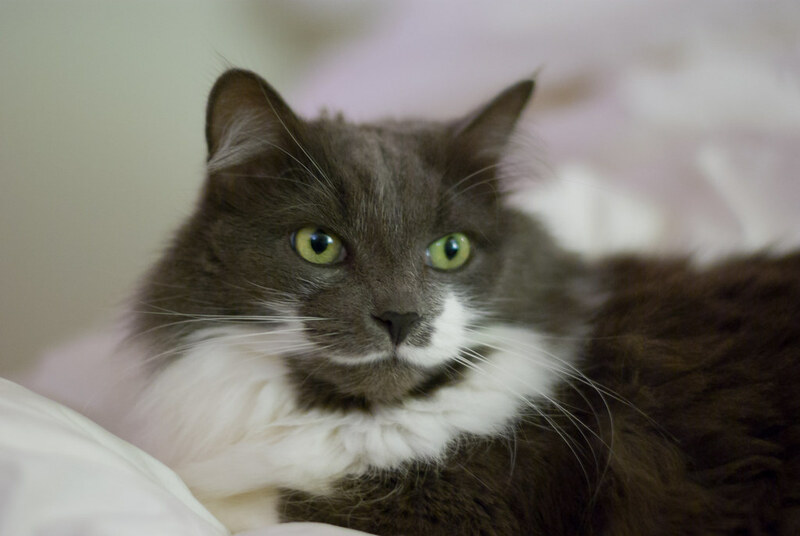 Some cats are more likely to sleep on freshly clean sheets due to them being picky about their cleanliness. Honestly, cats are very finicky animals. Essentially, you must create an atmosphere that your cat will gravitate toward for their sleeping sessions. 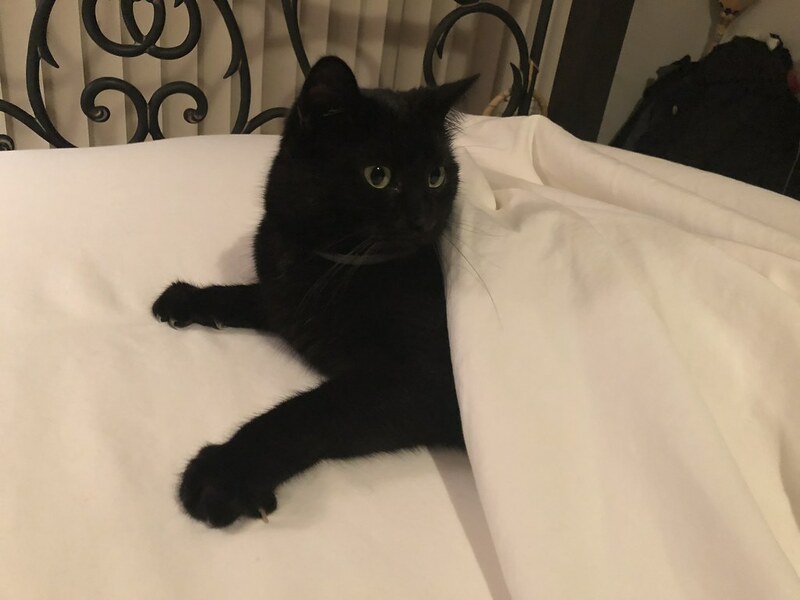 In my case, freshly cleaned sheets didn’t work because my particular cat likes wrapping himself up in things that contain my scent. So, I put on an old sweatshirt and next thing you know he was sleeping right to me. In your case, it might be something completely different. With this in mind, try and notice what items your cat likes sleeping on and what’s similar about them. Once you finally get them to sleep on the bed, you must reinforce this as a good behavior. For example, a scratch under the chin or a couple of treats will make them start associating sleeping in the bed with being a good behavior. In my experience, one or two cat treats should do the trick. However, make sure to wean them off the treats after sleeping in the bed becomes a natural behavior. After all, you don’t want their diet to become unhealthy. As with any animal training, you must remain consistent with the process. For instance, don’t all of sudden stop doing the nightly play session because your cat has become accustomed to sleeping on the bed. By doing so, you’re undermining the routine that has made them sleep in your bed in the first place. In skipping a step, you deny them of the routine they’ve got used to having in their life. Having a cat sleep in the same bed with you isn’t always easy. There will be times where they wake you up by meowing or just continually moving. If this happens, it’s pivotal you ignore them. Therefore, don’t feed them, play, or react to them in any way. Instead, go back to sleep and get up when you want. Then, when you finally do get up, continue to ignore them for at least 15 minutes. In doing so, you’re teaching them these bad behaviors don’t garner your attention. As a result, they’ll stop doing them. And make sure you don’t yell at them either; this will only make them continue to do the behavior. After you weed out the bad behaviors, all you need to do is keep the routine and enjoy your new cuddle time with your cat. Just remember, consistency is critical. If you stick to your routine, your cat should turn into a cuddle cat in no time. Do you have any other tips on how to get your cat to cuddle at night? Share below! I’m sharing this with my friend. She has a cat who thinks bed time means race around the house at top speed time. I could not have read this post at a better time. I recently took in a rescue cat and he is so active. He very rarely likes to cuddle but when he does, I love it! I’ll be sure to follow these tips and see if he starts to cuddle even more. Sending your link to my mother in law, she has the cutest cat ever! Sending this to my mother in law. She has the cutest cat ever!! 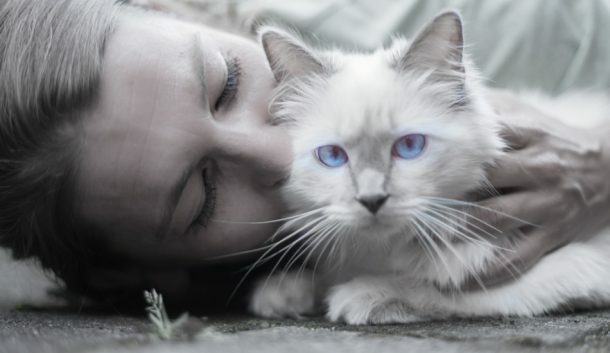 It’s a lot of work to train pets sometimes, but these are great cat cuddling tips. I didn’t think about cats wanting to or enjoying snuggling since they are such their ‘own’ creature. But these steps were terrific. I will share with my cat friends if they are wanting to do this. These are really awesome tips! Makes me excited to get a cat. my cats are such cuddlers! I love it! These are some great tips! Hopefully help a lot of wanna be cat cuddlers out there! I know so many cats aren’t fond of it! Cats like to cuddle? I never owned a cat but I thought they were against that lol. Well good tips for those who want to try!